In the time of the Emperor Diocletion, St Ischyrion was an officer of the Roman Army serving under a magistrate in Egypt. His master commanded him to offer sacrifice to the idols, and because he refused to commit that sacrilege, reproached him in the most abusive and threatening language. 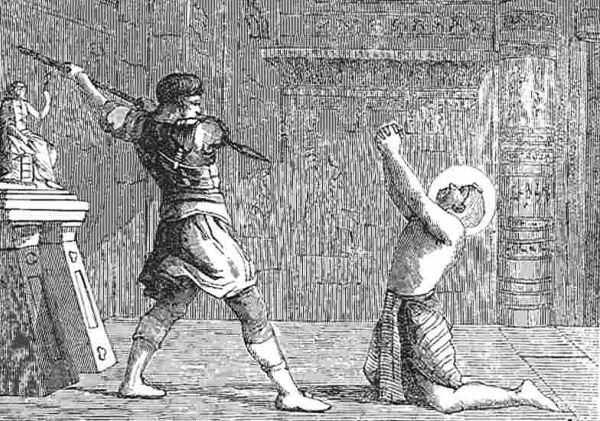 Giving way to passion and superstition, the commanding officer at length worked himself up to such a degree of frenzy as to run a stake into the entrails of the meek servant of Christ, who by his patient constancy attained to the glory of martyrdom. Five other soldiers died in witness to their faith around the same time. Reflection: It is not a man's terrestrial condition, but his virtue that can make him truly great and truly happy. However lowly a person's station or circumstances may be, the road to both greatness and happiness is open to him; and there is not a servant or slave whom God will not sustain, if he is fired with the laudable ambition of arriving at the summit of Christian perfection.